Milagrow MGPT09-8GB is one of the better SIM calling Tabs available in the market. This “Tabtop” is a 7 inch device which runs on Android 4.0.4 ICS version but is Jelly Bean Ready (Android’s latest version) and hence can be upgraded anytime in future, easily. The Tab is also popular carrying the name “Tabtop 7.16C” in the market. The Tabtop features a 1GB RAM and 1.2GHz Cortex A8 processor on board. At the screen resolution front, this device offers a crisp 800×480 pixels and 137ppi. One of the astonishing features (out of many) is the Taptop fully functional support to external hard disks up to 1TB, which is a rare feat yet. This Tabtop is all prepared to function with even the 4G dongles, waiting around the corner. All in all, an obvious future Tab on our hands. The best deal for the Milagrow MGPT09-8GB is hosted at Milagrow’s official website. Grab it before long! 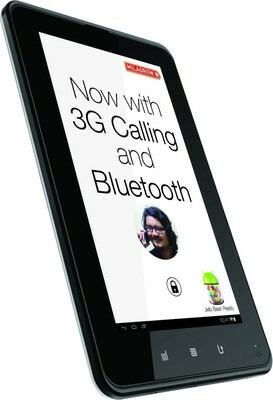 You can also buy it online from Flipkart.